I love, love, love the natural disasters we get in Washington, DC. They don’t wreak anywhere near the havoc and devastation that their more ferocious cousins do in places like Haiti and Japan — but they provide endless entertainment for me, and they get me out of stuff I don’t want to do. Three days ago, we had an “Earthquake” that caused basically zero damage (unless you live in an 18th century house with a chimney or the Washington Monument), but which resulted in full office shut-down and a fun adventure on the way home. She made landfall over North Carolina a couple of hours ago and will likely hit DC tomorrow and Sunday. The weather is currently calm but cloudy and getting more humid by the minute. My apartment building has warned me that my plants and wreath will become flying “projectiles” of death if I don’t lash them down or bring them inside (neither of which I’m planning to do). And here’s what I love (aside from the inherent adventure of getting hit by a hurricane): Half the stuff I was dreading this weekend just got canceled! Over the past few days, my brief moment of balance and calm has gradually deteriorated, and it was on course to come crashing to pieces this weekend. Tomorrow I was supposed to spend approximately 5 hours in choir rehearsals for two different choirs, and then attend the evening session of Stake Conference. On Sunday I was supposed to attend the regular session of Stake Conference, plus sing in the choir (which meant getting there an hour and a half early and staying through the end), and then turn around and prepare and host a dinner party at my apartment for several families in the ward — which meant that I would need to spend my free time on Saturday (between choir practice and Stake Conference) getting groceries and preparing the dinner and cleaning my apartment. A busy enough weekend in its own right, but then add to that work demands that will require me to spend between 15 and 20 hours this weekend working in order to meet Monday deadlines. In light of Hurricane Irene that is expected to pass through our area on Saturday evening and Sunday evening, we have been advised by the Area Church Authorities that we should prepare our members and take every precaution possible to ensure the safety and well-being of the members. In consultation with the Area and General Authorities over the Northeast Region, we have decided to reschedule the Stake Conference originally scheduled for this weekend and move it to September 10 and 11. Our primary concern is around the safety of our members and the likelihood of power outages throughout the Stake. Accordingly we will also cancel all Church services for this weekend. Not only did they cancel Stake Conference, but also all the choir rehearsals and the small group dinner! Yay! I don’t have to pull an all-nighter after all! Church getting cancelled is indeed a blessing. Yay for a somewhat less crazy weekend! 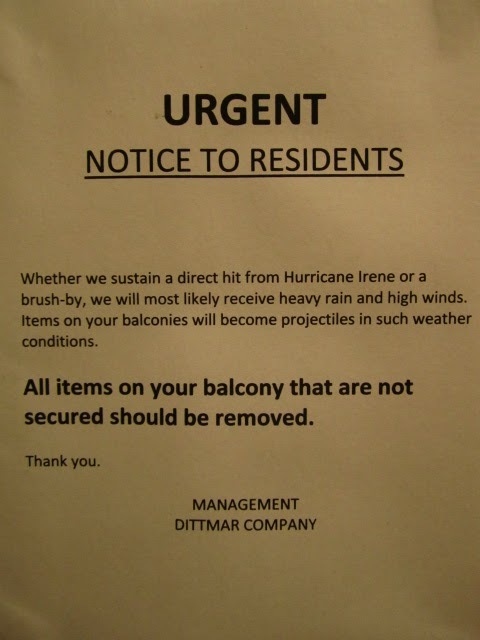 I urge you to reconsider not secure the objects on your balcony! Having suffered from various slivers throughout my life, I would hate for you to have to face the person impaled by your wreath….